After watching the video, audiences claimed that the UFO spotted in the footage could be either an alien vessel or a secret military spacecraft. Tyler Glockner is a world-famous conspiracy theorist who runs the YouTube channel 'Secureteam10'. Over the past few years, Glockner has released several videos on YouTube, and most of them talk about the existence of alien life. A couple of days back, Glockner released a strange clip apparently shot from Nevada, and it shows a bizarre unidentified flying object (UFO) speeding at a dramatic speed in the skies. Interestingly, the clip was shot in broad daylight and the UFO was seen speeding across the skies in an unbelievable manner. It should be also noted that this event took place in an area which is very near to the notorious Area 51. Conspiracy theorists strongly believe that Area 51 is a highly classified remote detachment of Edwards Air Force Base where alien technologies are tested by the United States military. As per these conspiracy theorists, UFO sightings are quite common in this area, and some of them even believe that extraterrestrials from deep space used to visit the US military officials at this location. "And Yeah, what I can tell is the object in this video has a very strange shape. It almost looks a spherical orb with something hanging from it. But it does not look like a balloon. Something is protruding in the bottom, almost like a plasma, green or blue color coming from the bottom. I should mention that it is moving extremely fast. Nevada is known for its secret military bases, Area 51. 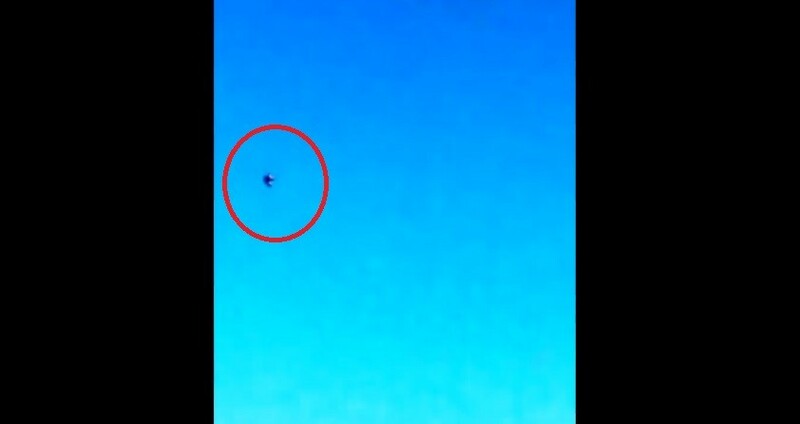 Strange UFO sightings are common in this area for over 67 years now,'" said Glockner in the video. The video uploaded by Tyler Glockner soon went viral, and it has already racked up more than 2,57,000 views on YouTube. Most of the viewers who have seen the video claimed that this UFO sighting is irrefutable proof of aliens visiting the earth. Some other people argued that the UFO spotted in the video could be actually a secret military spacecraft developed using reverse engineering by the United States military. This is not the first time that Tyler Glockner is spotting something strange near Area 51. A few months back, using Google Earth, Glockner spotted a mysterious structure near the secret military base. In the video, Glockner showed three openings inside a mountain, and it made many people believe that aliens are secretly living in this base. Glockner later claimed that these openings might stretch back for miles into the ground, and made it clear that the discovered site is very similar to that of the one Bob Lazar described several years back.